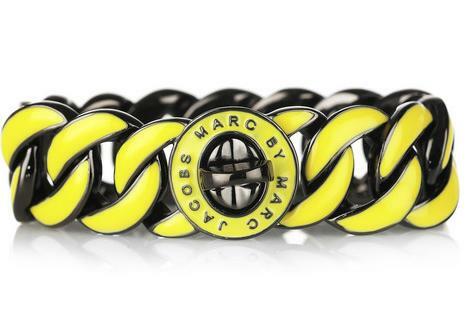 Fashion’s never-ending neon fixation is certainly not dwindling any time soon, and Marc Jacobs is firmly on board with this fabulously urban Katie Enameled Brass Bracelet. Complete with twist lock fastening adorned with the designer’s signature stamp, the gunmetal-hued woven brass chain detail teamed with bright yellow enamel pop ensures to add a flash of hard-edged glamour to any outfit. Want to know the next vital date for your style diary? Mouses at the ready, because January 25th 2012 will mark the day when monochrome-loving Chanel director Karl Lagerfeld will be launching his new affordable ‘Karl’ line exclusively at Net-a-Porter. The 100 piece rock-and-roll themed collection will include everyone’s favourite Lagerfeld staples: leather skirts, bib-front shirts, detachable collars, luxe sportswear and plenty of black black black, but the difference will be in the affordability, with price points starting as low as £50. Natalie Massenet, founder of Net-A-Porter, says of the new line: ‘The collection will speak to every woman who wants a bit of the inimitable fabulous street chic that Karl Lagerfeld is known for.’ The luxury online retailer will carry the label exclusively for the first four weeks following the launch, after which they will continue to be the only online seller of the collection.